This Father’s Day, June 17, honor the special Military Veterans in your life with a personalized gift from Veterans Commemoratives. A customized “gift of recognition” is a wonderful way to show someone you love how much you care for them on their special day. Whether it’s a husband, father, son, grandfather, nephew or friend, let him know how much you appreciate their service in the United States Military. These are gifts that they will cherish forever and pass down to future generations. Since 1987 Veterans Commemorative), has proudly led the way in honoring Military Veterans who have served throughout the world in peace and war, from WWII, Korea, Vietnam, Desert Storm, Afghanistan, and Iraq. 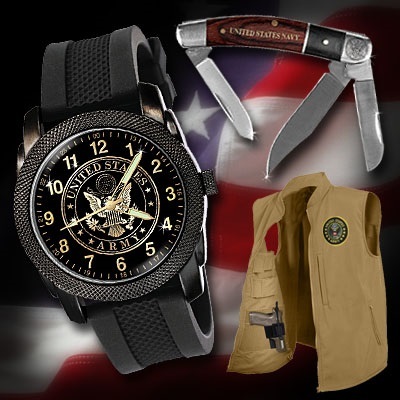 We offer exclusive, highly personalized Military and War Service Watches, Jackets, Commemorative Knives and Plaques, and accessories. Check out each category on vetcom.com! Most items, ordered by June 5th ship in time for Father’s Day delivery! Place your orders today to avoid disappointment! May 11 is a day set aside to recognize the contributions and sacrifices of the spouses of our U.S. Military troops.